Pablo Beltran, chief of the group’s peace delegation, said his team was unaware the rebel army was planning the attack. HAVANA - The head negotiator for Colombia's rebel National Liberation Army is denying advance knowledge of a bombing attack on a police academy that killed 21 people last week and is demanding that the Colombian government allow negotiators to return safely from Cuba. Pablo Beltran, chief of the group's peace delegation, said his team was unaware the rebel army was planning the attack. He called on Colombia to follow the protocol agreed to by government and ELN negotiators that allows the rebel leaders to return from Cuba in the event peace talks fall apart. The document signed by the lead negotiators from each side gives the ELN members 15 days to return to their jungle camps with specific guarantees to ensure their safety. "We weren't involved," Beltran said in a Monday interview with Telesur, a network run by Cuba, Venezuela and other leftist Latin governments. "We are going to insist, until the final day, that the government provides guarantees for our return." "Our task in Cuba is to bring forward the agenda of talks," Beltran told Prensa Latina, a Cuban state-run press outlet. "We did not know about the events in Colombia nor did we have anything to do with them," he added. Rebel leaders have been on the island for peace talks with the Colombian government to end over five decades of conflict, but those efforts are now stalled after authorities blamed the ELN for the car bombing at a police academy in Bogota on Thursday. ELN members in Colombia have stated they were responsible for Colombia’s worst terror attack in recent years. 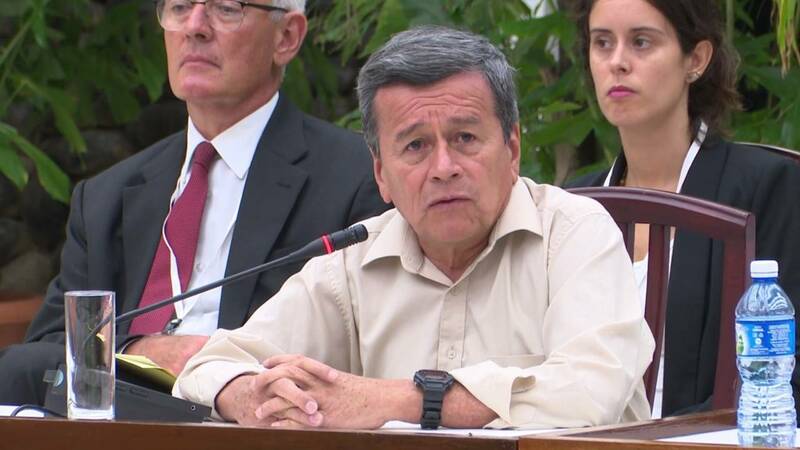 Colombia President Ivan Duque reiterated his call Tuesday for the Cuban government to arrest and extradite the ELN negotiators on the island. The Cuban government has stated that it intends to follow the previously agreed-upon protocol for a break in the dialogue. In a tweet, Cuba's Foreign Minister Bruno Rodriguez said, "Cuba has never allowed, nor it will ever allow, its territory to be used for the perpetration of terrorist actions against any State. Cuba has strictly complied with its role as guarantor and alternative venue of the Peace Dialogue between the Colombian government and the ELN." Guarantor country Norway said Tuesday that it also intends to honor the agreement. "Norway should fulfill its promises," the nation's ministry for foreign affairs wrote in a letter to Colombian officials obtained by The Associated Press. Colombian officials are arguing that the protocol no longer holds weight because it was signed by a previous administration and that Cuba is required under international accords to cooperate in ensuring those responsible for a terror attack are held responsible. "We hope that the international community supports us, and we are calling on the Cuban government to help us obtain justice in Colombia," Duque said. The protocol for a break in peace talks allows negotiators with Colombia's last remaining rebel group to travel home through Venezuela. It also requires the military to halt any activity against pre-identified rebel strongholds for a 72-hour period during their return. Peace talks began under former President Juan Manuel Santos, who signed a peace deal with the larger Revolutionary Armed Forces of Colombia in 2016. However, talks with the smaller ELN have consistently struggled to advance for a variety of reasons, including the rebel group's decentralized structure, making any implementation difficult. Duque has argued since his election last year that talks with the ELN should continue only if the guerrillas hand over all kidnapping victims and cease violent activity.